Well tomorrow night’s the night! 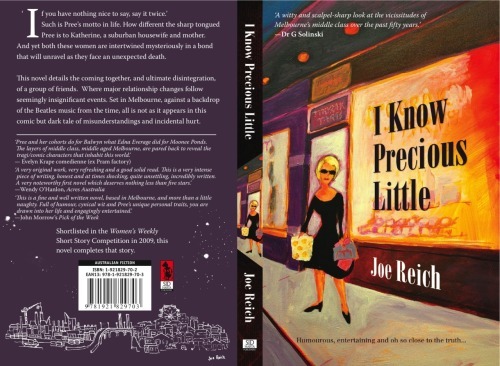 I am about to crawl into bed before tomorrow morning’s early start and flying down to Melbourne for the launch of Joe Reich’s I Know Precious Little at 6.30 at Readings, 701 Glenferrie Road, Hawthorn, East Melbourne. Oh and I will be presenting the author. Now as for the future of this blog – I am going to continue writing reviews. Frankly I am having too much fun. I also have some news – Stephanie has set me yet another challenge! This time it is to see just how many books I can read on the 22 hour flight home to Dublin. I decided to visit my folks for a short holiday and she thought this a challenge almost as demanding as my two hundred and eighty seven reviews….well it will mean missing out on the on-flight entertainment. Looking forward to what the future holds people. And if you’re around tomorrow night in Melbourne, do drop round to say hello. Folks I have some exciting news. Author Joe Reich, whose book I Know Precious Little I reviewed for the blog, has invited me to speak at the book’s official launch at Readings Hawthorn in Melbourne. As you can imagine I am ridiculously excited about this and eager to try out my Irish brogue on a live audience. The event is set to commence at 6.30 at Readings, 701 Glenferrie Road, Hawthorn, East Melbourne. So if you’re in town, do come along for chat. Still, to move to Australia…the distance, the cost, the reversal of day and night, summer and winter, left no room for compromise, no room for any semblance of a long-distance relationship. Hmm, yes, I can relate. Stephanie and I criss-crossed the world two or three times. That sentence carries associations of whimsy, spontaneity ‘ah sure let’s just hop on the ol’ plane there and fly to Austraaaliah’. The truth was the entire process made for a lot of heartache, a lot of planning, expenditure and of course, it is still not over. So I was delighted to receive this book in the post from author Christine Darcas, accompanied by a lovely note, which addressed the similarities between our situation and the plot of the book. Hell that note might have led me to give the book a good review anyway! (Fortunately I enjoyed it regardless). Ginny’s career in New York has just hit a large speed-bump. A personality clash with her boss meant that when a series of firings hit the office her head was on the chopping block. Add to that a problematic relationship with an ex-boyfriend who seems to relish complicating her life, when she calls an old friend in Australia and gets an invitation to visit, there really does not seem like anything is keeping her from going. Except of course her many unresolved issues with her mother, all bound up in feelings of abandonment courtesy of a long-departed father that still affect both women. For Ginny her prematurely concluded dancing career, following rejection from an elite ballet academy as a teenager, is an event in her past that has crystallized her feelings of resentment towards her mother. Why was she encouraged to dance for so many years despite having the ‘wrong body type’? Ginny’s friend Eloise is working in Melbourne on assignment from New York. Unlike Ginny, she is confident, professional and focused on her career. Except when the two meet, she finds her formerly unflappable friend devastated by a pregnancy scare. Ginny has left her own life in New York in a shambles and has travelled the world only to find herself involved in a new mess. However, Australia is the new ‘land of opportunity’. There Ginny finds herself new friends and even a new romantic interest. What’s more she rediscovers her love of dance, this time choosing salsa over ballet. The possibility of a new life in Australia forces her to choose between leaving everything and everyone she knows behind and a fresh start in a place where she has no connections, or real support. 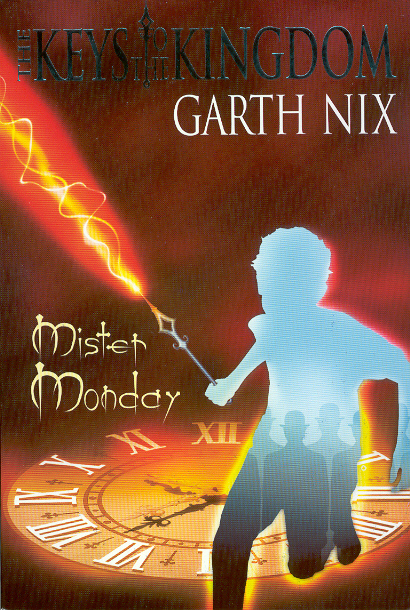 I was surprised by how much I enjoyed this book. For one I really enjoyed how the internal emotions of these characters are realized and many of them quite likable too. The loaded exchanges between Ginny and her mother feel very true to life. In fact that was what I enjoyed most about the book – the sense of ordinary realness. Please do not understand what I mean by that phrase, I am not damning Darcas’ writing with faint praise. I feel Spinning Out does an excellent job of capturing moments in people’s lives. Tragedies occurs in small doses, but can stretch out across a lifetime. The decisions Ginny makes at each turning point have profound effects, even if at first they seem whimsical. Romance too, is not depicted as some cosy end of a narrative. In fact Darcas’ storyline covers material that other writers might stretch out into two, or three novels. Much like Stephanie and my adventures in yo-yoing across the globe, there are no easy endings. Gentle humour and a sense of what is real combine to make a beautifully understated novel about finding your way in life. With my thanks to the author for the review copy.